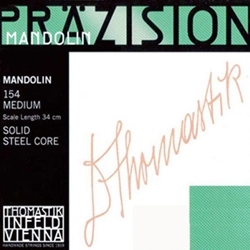 Prazision 154 Medium Mandolin Strings.. The strings are flat wound on chrome steel and highly polished except the plain e-string, which is made of tin plated silver steel. They are made of steel core special alloy with high elasticity and durability. The sound is clear and brilliant.